Spring is the season of new beginnings when the Earth seems to come to life again. 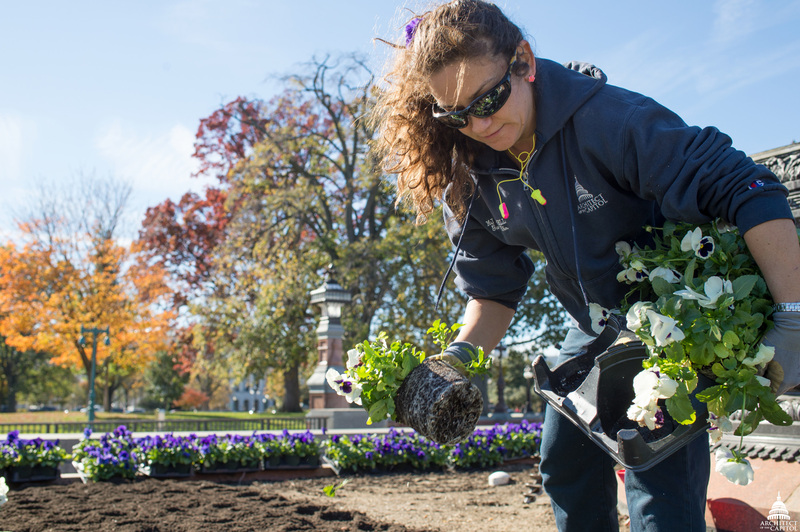 But it is the year-round planning, preparation and hard work of the Capitol Grounds team that ensures buds bloom, vibrant colors delight and fragrant flowers excite the senses on Capitol Hill. Ted Bechtol, Capitol Grounds Superintendent, says fall preparations for the spring make autumn one of the busiest times of the year for his team. The work that Capitol Grounds does during the fall helps to create a beautiful campus in the spring that is popping with color and bursting with a healthy, robust glow. "Our gardeners pull, till and amend more than 160 flower beds and plant springtime bulbs. Our maintenance shop is busy hauling materials for the gardeners, cleaning and making repairs to fountains, and servicing the Capitol Reflecting Pool. And our tree care specialists are preparing recently planted campus trees to not only survive cold weather but thrive in the warmer months," said Bechtol. Ralph LoJacono, Supervisor of the Gardening Division, is constantly watching the weather, the calendar and the clock during the late summer and fall months. "Timing is essential for us. I begin ordering approximately 110,000 bulbs in August for fall planting. Our team is trying to clear thousands of leaves from flower beds while also planting bulbs and doing turf work. At the same time, we're busy aerating the turf lawns, seeding, sodding and doing light organic fertilization and mulching throughout the campus," said LoJacono. The flower bed color palettes are themed, blooms in 2017 will be patriotic colors — reds, blues and accents of white — in a nod to the 58th Presidential Inauguration. "We get comments on the colors, and we take those into account for future color palettes," said LoJacono. Tourists, congressional staff and even members of Congress notice the floral displays and share their likes — and dislikes — with the Capitol Grounds team. To time a peak bloom period, the Gardening Division also considers types of bulbs that bloom earlier, watering needs and warmer locations on campus (the House-side of the U.S. Capitol Building gets more sun). Cleaning the fountain at Peace Memorial. Milton Lee Dennis, Supervisor of the Maintenance Division, coordinates with his colleagues to haul old organic materials off campus and truck in new materials and support supplies in preparation for the spring. 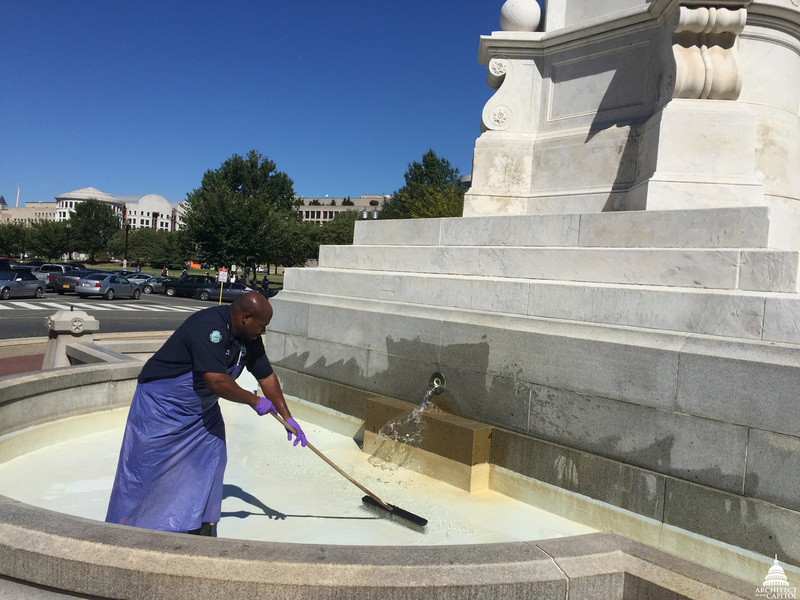 His team, which consists of masons, plumbers and heavy equipment operators, is also busy preparing the fountains and the Capitol Reflecting Pool. "The fountains are high-maintenance. We clean the smaller fountains twice a week in the spring, summer and fall to remove particulate matter, maintain water flows and clean stains. But our biggest challenge is the Capitol Reflecting Pool," said Dennis. The Maintenance Division drains and cleans the Reflecting Pool in the fall with heavy equipment to remove the sludge that collects throughout the year. This annual rite of passage ensures that the water in the Reflecting Pool will sparkle and delight visitors — and ducks — in the spring. Capitol irrigation systems are flushed and winterized and catch basins are cleaned — repeatedly — to ensure proper drainage on the campus. The division also ensures leaf piles are removed and stored for future fertilizing needs; oversees snow preparations, including purchasing salt, ice melt and repairing snow removal equipment; and coordinating the winter fuel supply, all of which happen in the fall. This preparatory work creates a safe campus for employees and congressional staff, as well as visitors, the heaviest volume of whom, come to the U.S. Capitol in the spring. 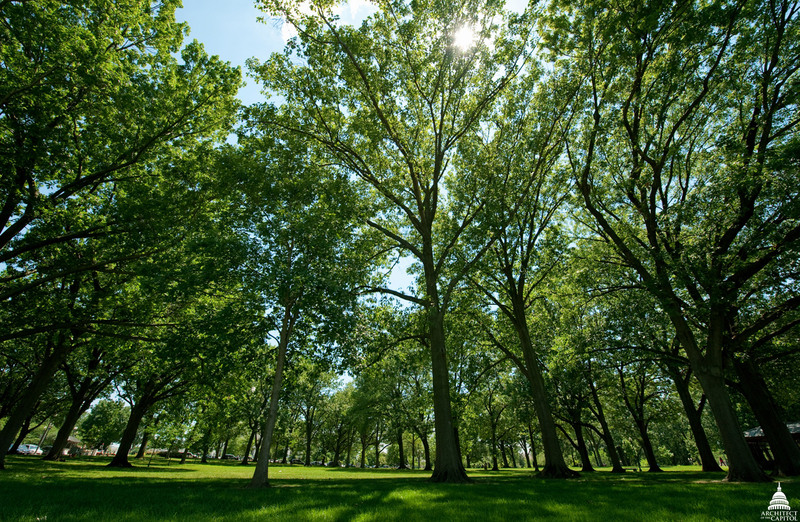 On the 274-acre U.S. Capitol Grounds, there are more than 4,300 trees cared for by the Capitol Grounds team. A central part of the U.S. Capitol's landscape plan, designed by famed Landscape Architect Frederick Law Olmsted, are trees. The delicate swaying of tree tops throughout Capitol Hill offer a picturesque counterpoint to the U.S. Capitol Building's formal architecture. Many of the trees on the grounds bear special plaques that identify their species and their historic significance. Throughout the year, trees lose vital nutrients in the soil. Capitol Grounds applies fertilizer to the soil across campus that helps the trees replace nutrients and improves resistance to disease, insects and weather. They also make sure that trees are well hydrated and trimmed. Members of the Tree Care Branch monitor the trees carefully year-round. As autumn approaches, the team pays special attention to any potential issues that limit a tree's success in surviving the winter. The Osage Orange trees on campus pose a safety concern with their heavy, hard oranges. As a result, Capitol Grounds carefully prunes them each year. Regular pruning of existing trees, for example, helps them withstand the added weight of snow and ice during the winter and thrive in the spring and summer months. "Throughout the year, we regularly prune campus trees to keep them healthy," said Rick Prince, Supervisor of the Tree Care Branch. Pruning of the Osage Orange trees are particularly important. The curious-looking oranges are heavy, hard and can be a safety concern. "We actually remove them from the tree on the South West Drive because they are a hazard. This usually takes about two days for one tree. It is very tedious work. The oranges are very heavy and harder than you might expect. We try to remove them before they start to fall from that particular tree because it's over a very busy sidewalk," said Prince. Autumn is also an opportune time to plant new trees. Temperatures are cooler and the trees are able to build root mass before the winter dormancy season. Soon, the trees planted in the fall will sprout new life and herald the arrival of spring on the Capitol campus. The diligent efforts of the Capitol Grounds team is evident to all who work and visit the Capitol campus. The team's hard work was recently recognized as the U.S. Capitol Grounds became an accredited arboretum. 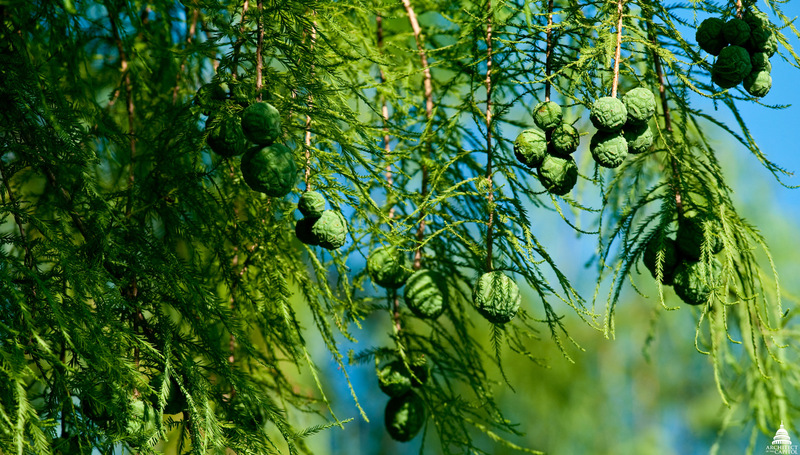 The grounds are now listed in the Morton Register of Arboreta, a comprehensive list of arboreta and public gardens that have a substantial focus on woody plants for the benefit of the public, science and conservation. As warmer temperatures return to the Washington, D.C. region, get outside to enjoy and appreciate the amazing work of the Capitol Grounds team! Want to Learn More About the U.S. Capitol Grounds? 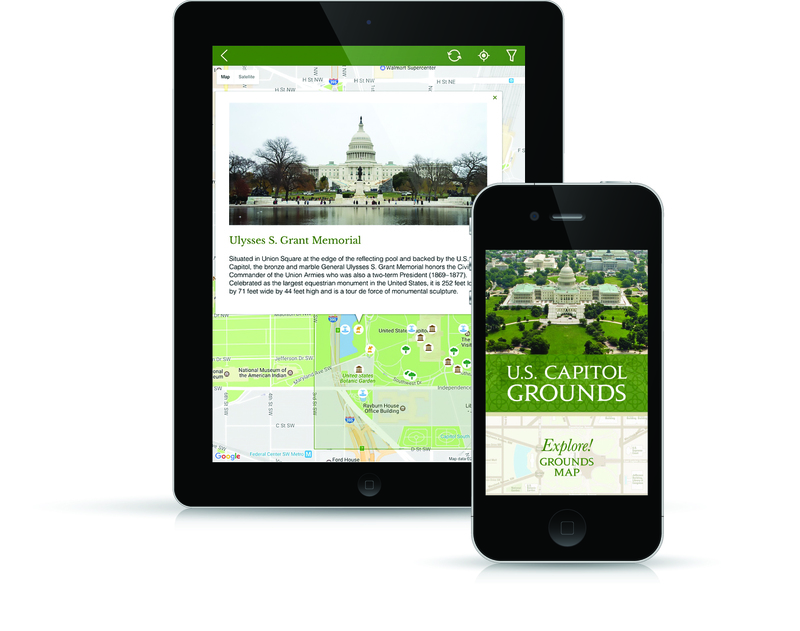 Download the U.S. Capitol Grounds App to your phone and explore photos, audio clips and historic details about the trees, hardscapes, fountains, special events and more on the Capitol campus. Use the map options to study specific features or narrow your search for information on a favorite pediment, monument or other outdoor detail. 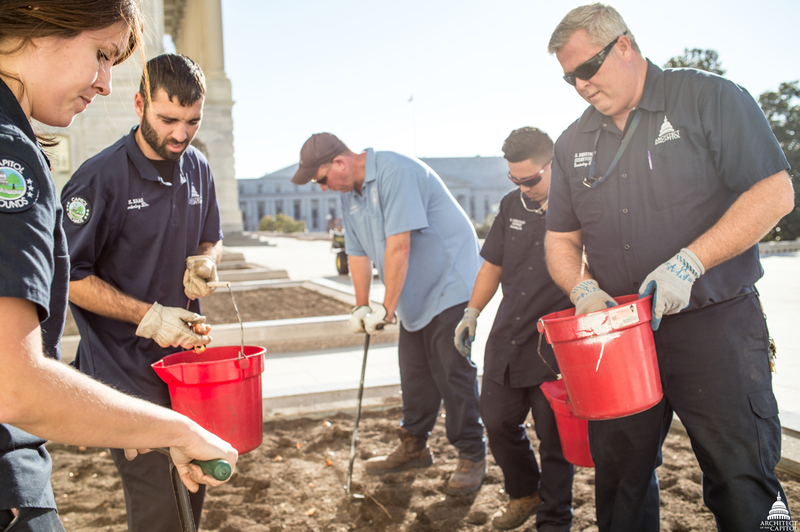 This is a great article to highlight the around-the-year efforts that the Capitol Grounds staff accomplishes. Thanks to them for keeping the grounds on the Capitol Hill complex so beautiful. Also, I downloaded the app from reading this article about it. Thanks for the information.